Lately I’ve been very engaged in the living of new stories, and not so much in writing them down. Sometimes they have to be lived for a while to know what to say about them. When I’m not drawing, sometimes I read over “old stories” I’ve posted here on the blog. So while I’m slowly getting used to my new surroundings and reflecting on my old ones, I’m grateful there are vegan bloggers out there I stumble upon who’ve made something I’d really like to eat with something else I’ve made, a something that makes my simple something extra special. And this time Yum Universe brought me just that. I recently finished the novel Cutting for Stone (which I found in a cute little free library a few blocks from home) and its Ethiopian setting and culture put me in mind of making injera. 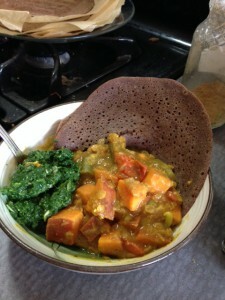 I’ve tried to make injera before with teff flour, but was never sure if I did it right. Often I left the batter in the pan too long and it would crack or tear. Or I tried to flip them when I shouldn’t have. From my reading about injera on the internet, it’s hard to know if this is an “authentic” recipe, since everyone seems to disagree about what constitutes that, but it’s authentic enough for me. And it’s gluten-free, easy, and great tasting enough to say wow on the first bite. I’ve paired them with the one-pot stew recipe I’m posting below (which is a mix of flavors, which is why I call it “Fusion”), but they are also good with just about everything else. So if you’d like to try your hand at gluten free injera, hop on over to Yum Universe’s Authentic 1-Day Ethiopian Injera:Gluten-Free 100% Teff Flatbread. I followed her good instructions, with the exception of leaving out the coconut oil for the pan. Instead I used a good non-stick pan. Her secret is accurate: if you cover the pan, they come out perfectly. (Much the same way McDougall hash browns come out of the pan when it was been covered.) My stove runs very hot, and it didn’t take mine as long to cook as it took in her recipe–they were done in nearly half the time. So watch for the bubbles and the change to a darker color. Like pancakes, the first one can be a little persnickety, but not if it’s cooked to being done. Thank you Yum Universe! These are a staple in my kitchen this month. They go great with this easy little stew, with a little bit of a spice kick from Susan’s Berbere Spice Mix (it’s in her recipe for really good Ethiopian Red Lentil Soup). To get my greens easily, I made a little “pistou” with thawed frozen spinach and just stirred it in while eating (recipe below). It was colorful and delicious and I’ll do it again and again, especially when I’m pouring over stories or drawings or just laying on the couch reading and not wanting to spend a lot of time in the kitchen. This makes enough for me to have 2 0r 3 servings, along with the spinach and the injera, but if you’re feeding a family or company you’ll want to double or triple the amounts. If you want to use tea for the liquid make a strong cup or so of some fruity spicy tea–Indian Spice, chai, whatever you like–about an hour before you are going to make the stew. Cut up your potato and green beans and tomato. There’s usually mostly potato and the other veggies are accents. Put everything in a medium sized pot and shake in spices of your choice. Bring to a boil and simmer until everything is done and soft, stirring occasionally. (I usually start out with the pot covered, then uncover it when it comes to the boil, then cover it after a while if the potatoes need some more steam to become tender. Alternating with the lid on and off helps achieve a stew consistency without it getting too dry or being too watery. When everything is tender and the lentils are soft, stir in a tablespoon of peanut butter powder, or a dab of peanut butter. 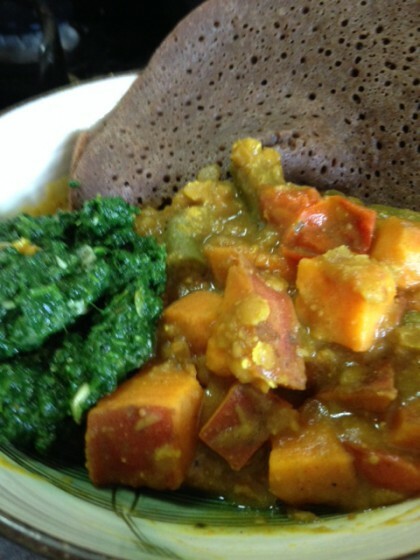 Top with Spinach pistou and eat with the delicious injera recipe from Yum Universe, or with cooked rice or millet. I am grateful to all the vegan bloggers in our “village” who inspire me and show me how to do something I’ve always wanted to do. 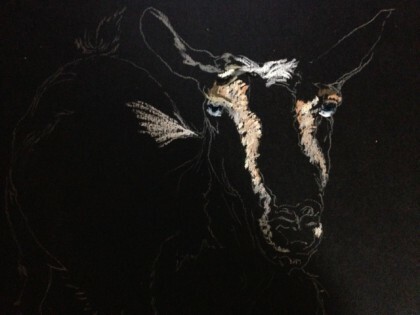 That gives me more time to ponder where to go next with this goat-pastel-in-progress. . .
A really lovely recipe there. Thank you. GF and yeast free, such a relief. All so delicious. Vegan perfect! Lovely to hear from you. On the move and now settling. I must admit I was surprised as the last Home was so much wanted by you and the pictures of the fire… Well it looked cosy and everyone so nice too. I am glad though you are so close with friends and coming along happily in your new home. Nothing for your housewarming except to imagine a beloved quince bush, grown from seed by me some years ago, just covered with green quince for the very first time. A beautiful and inspiring sight for those patient gardeners that love nature and it’s bounty. Just made my autumn harvest celebrations this year and I hope some make it through. My field has become such a sanctuary for feral cats, birds and nest boxes carefully high (with good holly to protect them from cats around them) many small creatures, a bees nest in an empty compost bin so that is now commandeered! I am busy broadcasting seeds all around my hedgerows of hollyhocks, sweet Williamson, wild garlic and plant, bit by bit, daffodils, and granny’s bonnets. Poppies nearly dry too and they are huge scarlet delights. Each year is filled with excitement as the different treasures reveal themselves. I hope you have some garden too and are very happy in your new home. Thank you for this lovely description of your Fall Equinox garden activities, AiryFairyCelt! I bet your quince tree is beautiful. Cezanne painted a still life of quince that has always been one of my favorites. We don’t see it much over here. It was a surprise to me too–a sudden opportunity I decided to act upon. I moved to Portland to be close to my son and daughter-in-law, and am starting to make some new friends here. I have a small paito with growing things, but there are two neighborhood gardens I can go and tend and help with, and I am enjoying that and meeting a few people that way. Fig trees are very common here, too, so I am enjoying the “fruits” of my walks with Romeo. All different and new. . .but somehow the same, as long as there are plants and gardens to share with others. Thanks for the well wishes!! Enjoy living your life stories……I always love reading about them after the fact! Can’t wait to see more of your goat pastel-in-progress in the future too! Oh my gosh, that goat is looking at me with such earnestness!! I think it wants to share your meal! This is exactly the type of flavors I love. The injera looks so yummy. Have you tried making socca? I did in the past using a lot of oil to fry them. I am going to try it one of these days in a non-stick pan. Hi Danielle! So glad you like the goat 🙂 He (or she) is my favorite one. The look may come from the kale stems I bring them–so yes, hoping maybe for something to eat. :) This one is the shyest and most slow, so rarely gets any since the others are faster and more aggressive. I haven’t tried making socca, but you made me curious to look it up. Sounds good. I found a less traditional version on Oh She Glows that doesn’t use oil. . .but does say to spray the pan a little. . This is a wonderful recipe! Simple, hearty, full of flavor. I may try it doubled, so that I can freeze and/or have leftovers for school lunches. The pistou is ingenious, too — ridiculously easy, and healthier than most recipes. I love how non-fussy and intuitive your recipes are–it’s refreshing and appreciated. I’ll have to try my hand at injera soon. I’m a novice in that department, but Heather is always a good culinary guide! Thank you Gena! I’m excited you may try it for your lunches during the school week. It would be great for that. And so happy like the pistou treatment too! Non-fussy and intuitive is what it’s all about for me. 🙂 And yes, Heather’s instructions are very helpful and clear, and wnet a long way in making my injera a success. Thanks Lee! You made me laugh with your “famous last words” :)–indeed! As Heather at Yum Universe says, each batch of batter looks slightly different and sometimes one batch is somehow “easier” than another–this after several batches. So be intrepid and see what happens–I think this would be a good “bread” for you. does this imply the rest is not so good?!! Made the stew last night and served it with rice. My husband and I thought it was delicious! I sprinkled about a Tblsp. of unsweetened coconut in the stew. Had a small bulb of fresh fennel so I chopped it and added it to the onions, sautéed it with the spices. Thank you! You’re very welcome, Anne! Your variations on the theme sound delicious!